Under the American's With Disabilities Act ( ADA ) and other various laws world wide used to protect individuals with disabilities, discrimination against an individual's Service Dog breed of choice is illegal. To learn more of the specifics of the American's With Disabilities Act ( ADA ), commonly asked questions about Service Dog use click here. In the USA it is important to understand the federal implication of this as it can be used as a defense to keeping one's Pit Bull if you are located in a region that has Breed Specific Legislation ( BSL ) that may otherwise limit or deny Pit Bull ownership. If you have a Pit Bull that is currently used in any kind of service work you should consider our Pit Bull Service Dog Certification Program. This is a FREE service available exclusively to APBR members who use their Pit Bull in any legitimate service capacity. If interested please contact us for more details. In order to receive your Pit Bull Service Dog certification your Pit Bull must qualify based on proof of ability and service. Additional factors may be considered based on service intent. 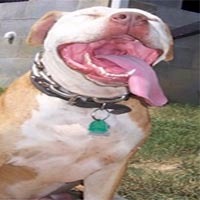 At the American Pit Bull Registry ( APBR ) we feel the Pit Bull is uniquely qualified to meet the service needs of today's community and work to support their use in all areas of service work. While the ADA only protects disability Service Dogs we do recognize the efforts of service dog Pit Bulls in all types of oficial service work including search and rescue, police work, cadaver dogs, counter-terrorism, etc. If you are currently an APBR member with a Service Dog Pit Bull in any capacity please contact us to let us know and we will provide you with full details needed to move forward with your Pit Bull's official Service Dog Certification as well as the benefits that come along with this service. 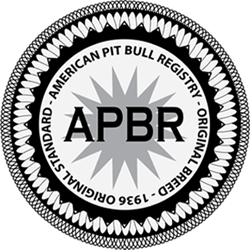 If you are not an APBR member you are encouraged to join and we will be happy to help you in the certification of your Pit Bull in its designated service capacity. For hundreds of years the Pit Bull dog has been bred to have a human friendly disposition and an overwhelming sense of owner loyalty. Dogs of all breeds have been man's assistants since the beginning of time. Given the natural skill set the Pit Bull has in various areas of service work this gives the Pit Bull an excellent opportunity to provide valuable and needed services in our community as well as debunk many of the common myths associated with the breed. Pit Bulls are currently used and suitable for all types of service work including drug detection, emergency rescue, service and therapy work, military service and much more. Pound for pound the American Pit Bull Terrier ( APBT ) is the strongest breed in existence and has a tenacity to meet its objectives as no other. Because the Pit Bull puts its own interest second to that of its owners the chances of it achieving a task are greater than that of other breeds. If you are a trainer and would like to volunteer to assist individuals in need please feel free to let us know as we have regular contact with individuals needing help with training assistance. If you are a breeder and would like to consider providing Pit Bull service dogs (as pups) to disabled individuals in need let us know and we will be happy to add you to our list for referrals.